24 X 6 Stamped Steel Baseboard Return - White Discounts Apply ! 24 x 6 baseboard vents have a strong enamel finish that is white. Your new air return grates will look great with any style of house. Baseboard vents are made of stamped steel construction. Air return grate fins are at a 20 degree angle with 1/3" fin spacing. Baseboard vents are durable and an excellent choice for new or existing construction. These air return grates are well crafted and priced right. ***Hint: The industry standard is to order using the actual hole opening size and not the air return grate faceplate size. White baseboard vents will fit a 24 x 6 inch hole opening. Actual Faceplate Dimensions (LxH): 25 3/4 x 7 3/4 inches. Air return grates are available for purchase in a variety of finishes and sizes. 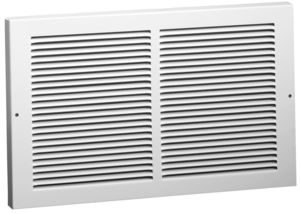 These baseboard air vents are a combination of quality and affordability, act now!